For AMD’s Radeon Technologies Group, 2018 was a bit of a breather year. After launching the Polaris architecture in 2016 and the Vega architecture in 2017, for 2018 AMD set about to enjoy their first full year of Vega. Instead of having to launch a third architecture in three years, the company would focus on further expanding the family by bringing Vega's laptop and server variants to market. And while AMD's laptop efforts have gone in an odd direction, their Radeon Instinct server efforts have put some pep back in their figurative step, giving company the claim to the first 7nm GPU. Following the launch of a late-generation product refresh in November, in the form of the Radeon RX 590, we had expected AMD's consumer side to be done for a while. Instead, AMD made a rather unexpected announcement at CES 2019 last month: the company would be releasing a new high-end consumer card, the Radeon VII (Seven). 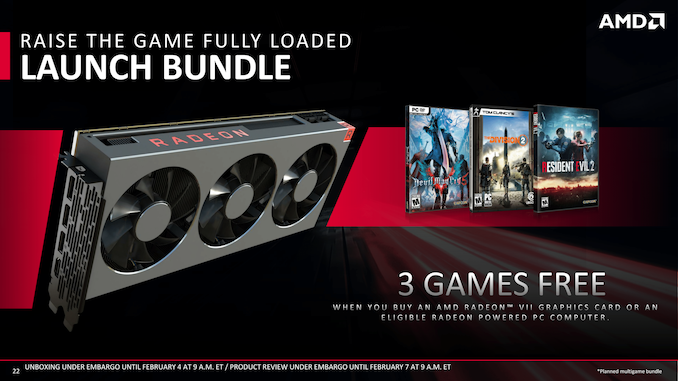 Based on their aforementioned server GPU and positioned as their latest flagship graphics card for gamers and content creators alike, Radeon VII would once again be AMD’s turn to court enthusiast gamers. 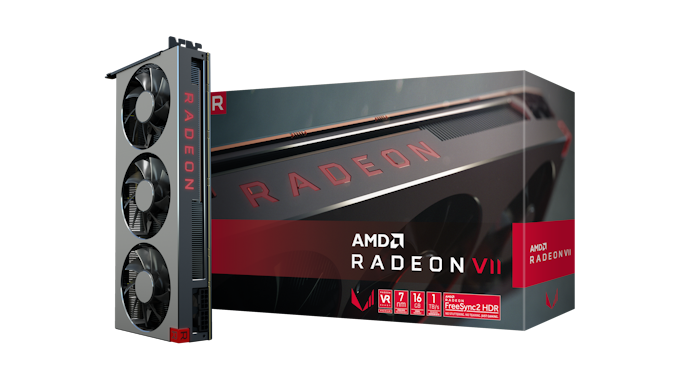 Now launching today – on the 7th, appropriately enough – we're taking a look at AMD's latest card, to see how the Radeon VII measures up to the challenge. On the surface, the Radeon VII would seem to be straightforward. The silicon underpinning the card is AMD's Vega 20 GPU, a derivative of the original Vega 10 that has been enhanced for scientific compute and machine learning, and built on TSMC's cutting-edge 7nm process for improved performance. An important milestone for AMD's server GPU efforts – it's essentially their first high-end server-class GPU since Hawaii all the way back in 2013 – AMD has been eager to show off Vega 20 throughout the later part of its bring-up, as this is the GPU the heart of AMD’s relatively new Radeon Instinct MI50 and MI60 server accelerators. First and foremost designed for servers then, Vega 20 is not the class of GPU that could cheaply make its way to consumers. Or at least, would seem to be AMD's original thought. But across the aisle, something unexpected has happened: NVIDIA hasn't moved the meter very much in terms of performance-per-dollar. The new Turing-based GeForce RTX cards instead are all about features, looking to usher in a new paradigm of rendering games with real-time raytracing effects, and in the process allocating large parts of the already-large Turing GPUs to this purpose. The end result has been relatively high prices for the GeForce RTX 20 series cards, all the while their performance gains in conventional game are much less than the usual generational uplift. Faced with a less hostile pricing environment than many were first expecting, AMD has decided to bring Vega 20 to consumers after all, dueling with NVIDIA at one of these higher price points. Hitting the streets at $699, the Radeon VII squares up with the GeForce GTX 2080 as the new flagship Radeon gaming card. Looking at our specification table, Radeon VII ships with a "peak engine clock" of 1800MHz, while the official boost clock is 1750MHz. This compares favorably to RX Vega 64's peak engine clock, which was just 1630MHz, so AMD has another 10% or so in peak clockspeed to play with. And thanks to an open air cooler and a revised SMU, Radeon VII should be able to boost to and sustain its higher clockspeeds a little more often still. So while AMD's latest card doesn't add more ROPs or CUs (it's actually a small drop from the RX Vega 64), it gains throughput across the board. However, if anything, the biggest change compared to the RX Vega 64 is that AMD has doubled their memory size and more than doubled their memory bandwidth. This comes courtesy of the 7nm die shrink, which sees AMD's latest GPU come in with a relatively modest die size of 331mm2. The extra space has given AMD room on their interposer for two more HBM2 stacks, allowing for more VRAM and a wider memory bus. AMD has also been able to turn up the memory clockspeed up a bit as well, from 1.89 Gbps/pin on the RX Vega 64 to a flat 2 Gbps/pin for the Radeon VII. Interestingly, going by its base specifications, the Radeon VII is essentially a Radeon Instinct MI50 at heart. So for AMD, there's potential to cannibalize Instinct sales if the Radeon VII's performance is too good for professional compute users. 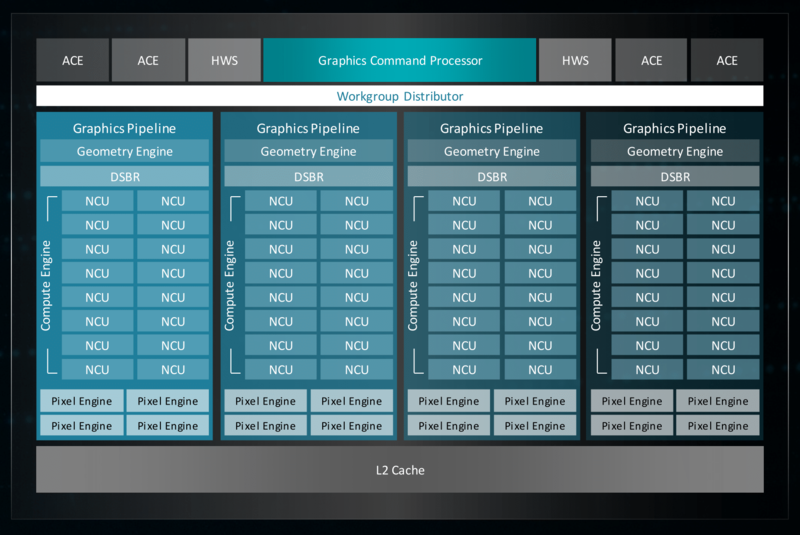 As a result, AMD has cut back on some of the chip's features just a bit to better differentiate the products. We'll go into more a bit later, but chief among these is that the card operates at a less-than-native FP64 rate, loses its full-chip ECC support, and naturally for a consumer product, it uses the Radeon Software gaming drivers instead of the professional Instinct driver stack. Of course any time you're talking about putting a server GPU in to a consumer or prosumer card, you're talking about the potential for a powerful card, and this certainly applies to the Radeon VII. Ultimately, the angle that AMD is gunning for with their latest flagship card is on the merit of its competitive performance, further combined with its class-leading 16GB of HBM2 memory. As one of AMD's few clear-cut specification advantages over the NVIDIA competition, VRAM capacity is a big part of AMD's marketing angle; they are going to be heavily emphasizing content creation and VRAM-intensive gaming. 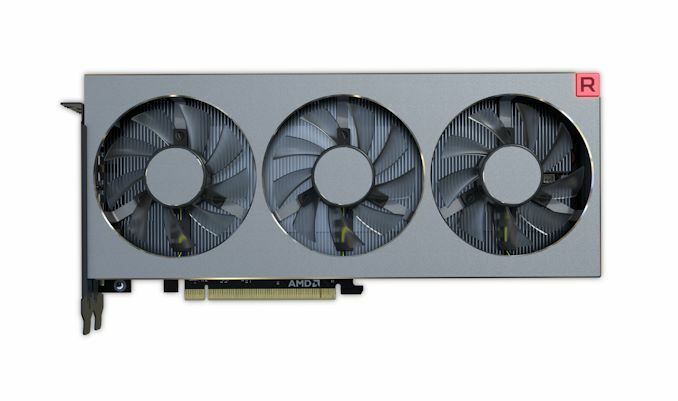 Also new to this card and something AMD will be keen to call out is their triple-fan cooler, replacing the warmly received blower on the Radeon RX Vega 64/56 cards. Furthermore, as a neat change, AMD is throwing their hat into the retail ring as a board vendor and directly selling the new card at the same $699 MSRP. Given that AIBs are also launching their branded reference cards today, it's an option for avoiding inflated launch prices. Meanwhile, looking at the competitive landscape, there are a few items to tackle today. A big part of the mix is (as has become common lately) a game bundle. The ongoing Raise the Game Fully Loaded pack sees Devil May Cry 5, The Division 2, and Resident Evil 2 included for free with the Radeon VII, RX Vega and RX 590 cards. Meanwhile the RX 580 and RX 570 cards qualify for two out of the three. Normally, a bundle would be a straightforward value-add against a direct competitor – in this case, the RTX 2080 – but NVIDIA has their own dueling Game On bundle with Anthem and Battlefield V. In a scenario where the Radeon VII is expected to trade blows with the RTX 2080 rather than win outright, these value-adds become more and more important. The launch of the Radeon VII also marks the first product launch since the recent shift in the competitive landscape for variable refresh monitor technologies. Variable refresh rate monitors have turned into a must-have for gamers, and since the launch of variable refresh technology earlier this decade, there's been a clear split between AMD and NVIDIA cards. AMD cards have supported VESA Adaptive Sync – better known under AMD's FreeSync branding – while NVIDIA desktop cards have only supported their proprietary G-Sync. But last month, NVIDIA made the surprise announcement that their cards would support VESA Adaptive Sync on the desktop, under the label of 'G-Sync Compatibility.' Details are sparse on how this program is structured, but at the end of the day, adaptive sync is usable in NVIDIA drivers even if a FreeSync panel isn't 'G-Sync Compatible' certified. The net result is that while NVIDIA's announcement doesn't hinder AMD as far as features go, it does undermine AMD's FreeSync advantage – all of the cheap VESA Adaptive Sync monitors that used to only be useful on AMD cards are now potentially useful on NVIDIA cards as well. AMD of course has been quite happy to emphasize the "free" part of FreeSync, so as a weapon to use against NVIDIA, it has been significantly blunted. AMD's official line is one of considering this a win for FreeSync, and for freedom of consumer choice, though the reality is often a little more unpredictable. The launch of the Radeon VII and its competitive positioning against the GeForce RTX 2080 means that AMD also has to crystalize their stance on the current feature gap between their cards and NVIDIA's latest Turing machines. To this end, AMD's position has remained the same on DirectX Raytracing (DXR) and AI-based image quality/performance techniques such as DLSS. In short, AMD's argument goes along the lines that they believe that the performance hit and price premium for these features isn't worth the overall image quality difference. In the meantime, AMD isn't standing still, and along with DXR fallback drivers, they working on support for WinML and DirectML for their cards. The risk to AMD being, of course, is that if DXR or NVIDIA's DLSS efforts end up taking off quickly, then the feature gap is going to become more than a theoretical annoyance. All told, pushing out a 7nm large gaming GPU for consumers now is a very aggressive move so early in this process' lifecycle, especially as on a cyclical basis, Q1 is typically flat-to-down and Q2 is down. But in context, AMD doesn't have that much time to wait and see. The only major obstacle would be pricing it to be acceptable for consumers. That brings us to today's launch. For $699, NVIDIA has done the price-bracket shifting already, on terms of dedicated hardware for accelerating raytracing and machine learning workloads. For the Radeon VII, the terms revolve around 16GB HBM2 and prosumer/content creator value. All that remains is their gaming performance. I think you are the one in denial over this. Nvidia is also guilty of the same thing. The entire Turing lineup is a die designed and R&Ded for the Enterprise customers. 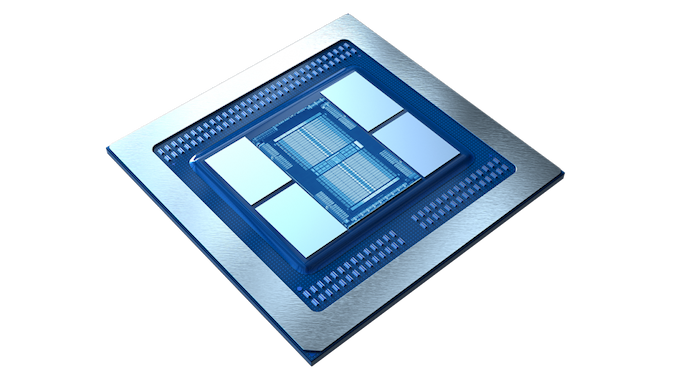 The "flagship features" they keep raving about for Turing are slapped together ways to use all the ASIC cores on the dies designed for AI and content creation. Its why when you compare a 1080 to a 2070, or a 1080ti to a 2080 (the same price bracket) you get almost zero rasterization improvements. Its a huge and expensive die reused from the enterprise department because no one else has anything competitive in the same space. The updated NVENC encoder chip may become a major selling point for the RTX cards for streamers/content creators. I'm actually disappointed Nvidia is not emphasizing this feature more. Once OBS Studio releases their new build that will further increase NVENC encoding efficiency it will create an even more compelling argument to switch to NVENC. I have been testing the new encoder and it's rivaling and beating medium preset x264 at 1080p60 using 8k bitrate. Single pc streamers will see steam quality improvements along with massive cpu resource savings. I'm of the opinion the dark horse selling point of these cards will be the new NVENC encoder. It appears the Turning generation is more of an advancement for content creators than the average gamer. Ray tracing is superfluous at this point for sure. If and I mean IF nvidia is holding back it's a purely financial move due to the huge overstock on GPU's caused by crypto currencies. Both AMD and nvidia massively underestimate how much demand crypto was creating. (IIRC AMD said during the earnings call now that crypto has dropped off that monthly GPU sales are less than half what they were) Supposedly there are more than 100K of nvidia cards (again the stuff I saw said that was somewhere between 3-6months normal gamer sales) sitting out there on store shelves rotting because of it, and it's so bad nvidia is having to take stock back from retailers that want the shelf space freed up. The Instinct M150 is a VEGA class card, the architecture is incredibly similar to Vega 56/64. There are not massive gains to be made here.